Ushijima Shrine Taisai (牛嶋神社大祭) is a great Autumn Matsuri happens at Tokyo. This Matsuri happens only every 5 years at September 15 to 17. This is the year of 2017. Taisai has a history of over 1100 years and has been carried by the people of Tokyo. The ritual parade has the priest, the followers of the each town, scared kids and caw car. The caw car, called "Horen" was used to be the car of the emperor in the old time. So, it represents the carrier of the gods. This parade travels all over the towns of Ushijima, and The leaders, the followers, and the kids will be changed at the each town. After the parade, there are Mikoshi parade and Bon Dance at night. The parade ends at the Ushijima Shrine. There is food stands at Ushijima Shrine. The area of the parade is around Oshiage Station. 1. use like Toei Asakusa Line to Oshiage Station. 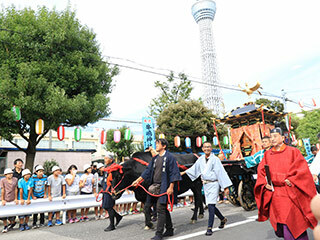 Ushijima Shrine Taisai is one of the oldest Matsuri Festival happens in Eastern Tokyo. Around the weekend of the sliver weekend in September. Starts from Tuesday to Monday. The major parades are on Friday and Saturday, and Mikoshi parade is happening on Sunday. This is the head shrine of the Honjo neighborhood, founded circa 860 AD by the great Buddhist leader Jikaku. Legend has it that in 1251 the shrine was visited by a bull demon which dropped a knot of hair as it ran around the shrine, and the knot was enshrined as a sacred treasure. The legend is commemorated in the statues of cattle deity that flank the main shrine building.